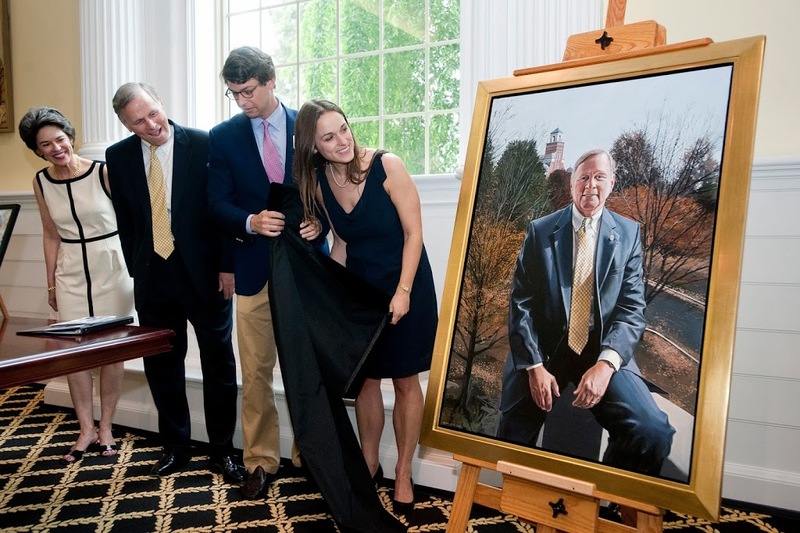 The Randolph College community joined together this afternoon to celebrate the renewal the College has experienced during the service of President John E. Klein and his wife, Susan, who will leave Randolph this summer when President Klein retires. unveiled presidential portrait during a reception at Lipscomb Library. While there were many points to celebrate—such as growing enrollment, improved facilities, and a stronger financial position—the personal touch that the Kleins have had upon the College became a dominant theme. The College community, including alumnae, alumni, and friends of the College, gathered in Smith Hall Theatre for a series of videos about the Kleins’ influence, musical presentations by a cappella groups Songshine and Voices, and speeches from community members who have worked closely with President Klein. Each portion of the presentation expounded on the ways the College has changed since Klein became president with the assignment to lead the College through a transition to coeducation. “Today we are celebrating the fact that John Klein said yes when we asked him to become our president,” said Becky Morrison Dunn ’70, chair of the board of trustees. As a surprise honor for Klein, Dunn also announced that the Board of Trustees is naming its beautiful conference room in the Student Center the John E. Klein Conference Room. Klein said he was honored by the presentations, but most of all he was honored by the opportunity to have led the College and worked with trustees, alumnae, faculty, staff, and students at Randolph. “While there are many aspects of Randolph that we will miss, it is really the people that will make leaving Main Hall the final time so difficult,” he said. After retiring on June 30, the Kleins will live in Washington, D.C., and they plan to return to Randolph for future events, including the inauguration of the new president, Bradley Bateman. He also looks forward to seeing the College’s progress continue.